Inspired by the events of an actual textile-mill strike in 1929, Wiley Cash creates the picture of one woman’s desperation. In the retelling of the Loray Mill strike and the courageous role of Ella May Wiggins, Cash vividly blends the archival with the imaginative. As the historian Perry Anderson has noted, good historical fiction has the ability 'to waken us to history, in a time when any real sense of it has gone dead.' When the willingness to suspend disbelief has taken on a new and sinister meaning, we not only need the novel of well-known history, we need the lost-to-history novel. Cash, with care and steadiness, has pulled from the wreckage of the past a lost moment of Southern progressivism. Perhaps fiction can help us bear the burden of Southern history, which is pressing down hard on us today. 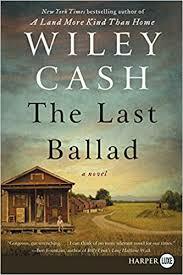 Powerful and poignant, North Carolina author Wiley Cash’s third and best novel tells the story of Ella May, an impoverished, imperfect and once again pregnant young woman who stumbles into the role of union activist at a textile mill...this is the very best kind of historical novel — one whose events are largely nonfiction, and whose characters, invented though they may be, probably closely resemble the souls who did walk the Earth during that time ...a fine and subtle writer, who tells an American story painful in the way the most authentic American stories are — replete with personal, political, sexual, racial and class strife, yet redeemed by gritty individual and community faith in a better, fairer world. She [Ella May Wiggins] touches the crowd with the tale of her life and a song she wrote about mothers toiling in the mills ... With Ella’s story at the core, Cash takes the reader into the lives of others who know Ella or intersect with her. He brings these characters to life, giving them their own conflicts and making them sympathetic even when they are weak (or worse) ...a fascinating slice of class and race in the early-20th-century South ... History aside, this novel stands on its own as a work of fiction. Some of the chapters on characters other than Ella might keep the reader’s attention away from the main story for too long, but Cash has made these characters interesting in their own right. What did you think of The Last Ballad?